DIN Standards are issued for a variety of components including industrial fasteners as DIN 551 Slotted Set Screws with Flat Point. 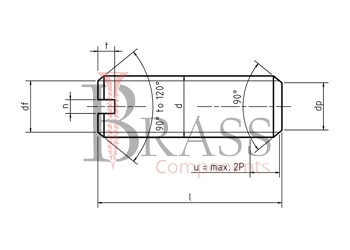 The DIN 551 screw is made mainly of carbon steel, stainless steel A2, A4, as well as brass. DIN 551 Screws are available in a wide range of sizes, shapes and materials. DIN 551 Screws are Slotted Set Screws with Flat Point. 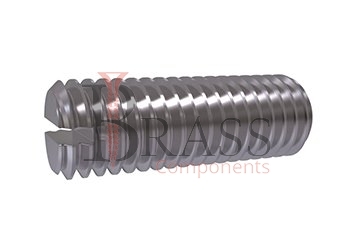 The Shape of DIN 551 Screws is characterized by presence of a flat end. DIN 551 Screws are Resistant to Temperature Changes, Anti Corrosion Properties, etc. DIN 551 Screws are complied with GOST 1477-93, ISO 4766 and UNI 6113 standard. The end of the adjusting Locking DIN 551 Screw has a special shape, which serves to fix the products relative to each other. A solid joint between grub DIN 551 screw and counter-piece can often be made more cost-effectively by gluing it. The main advantage of the DIN 551 Screws is the exclusion of additional elements in the joint application with it. DIN 551 Screws are known as the Most Common and used type of Metal Fasteners. The Set Locking DIN 551 Screws fall under different standards depending on the shape of the end, which may be conical, cylindrical, drilled, stepped with a sphere or cone, the shape of the slot is also influences. DIN 551 Screws for sliding strip ends with profiles. Quite Popular in Machine Building, Instrument Making and other various industrial and manufacturing Industries. Standard range of DIN 551 Screws are designed to clearly fix the position of parts relative to each other. Widely used in Quick Fastening and Installation. We manufacture DIN 551 Screws as per Custom Specification and export in France, Italy, Switzerland, Poland, Greece, UK and other European Countries. For more Information, Please Contact Us or Inquiry Now.